JANELLE PATTERSON The Marietta Times The crowd of Marietta visitors grows despite gray clouds overhead Friday during the Ohio River Sternwheel Festival. 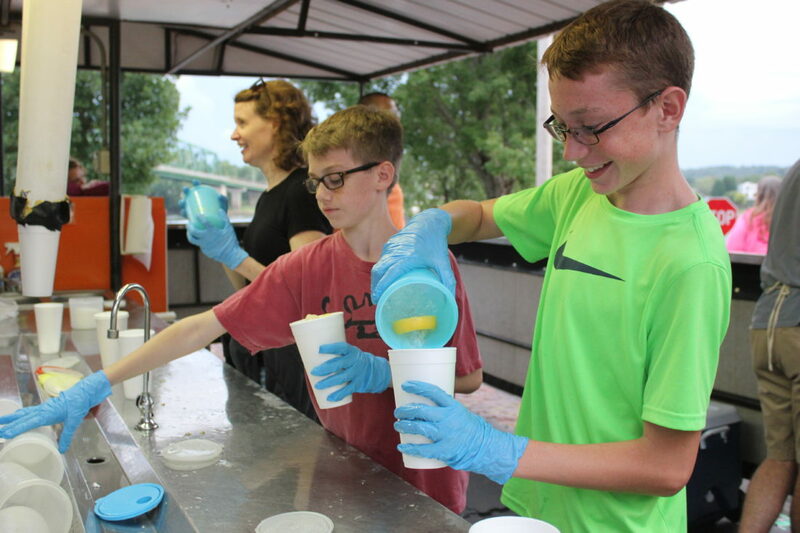 JANELLE PATTERSON The Marietta Times Max McCabe, right, and Miles Young, left, make lemon shakes for the Marietta Tigers Friday during the Ohio River Sternwheel Festival. JANELLE PATTERSON The Marietta Times Members of the Marine Corps League gather in awe of the memorial plaque erected for the Ohio River Sternwheel Festival Friday on the Ohio River levee. Sternwheel 4: JANELLE PATTERSON The Marietta Times Bev and Steve Pottmeyer open the Ohio River Sternwheel Festival at the Ohio River levee Friday. 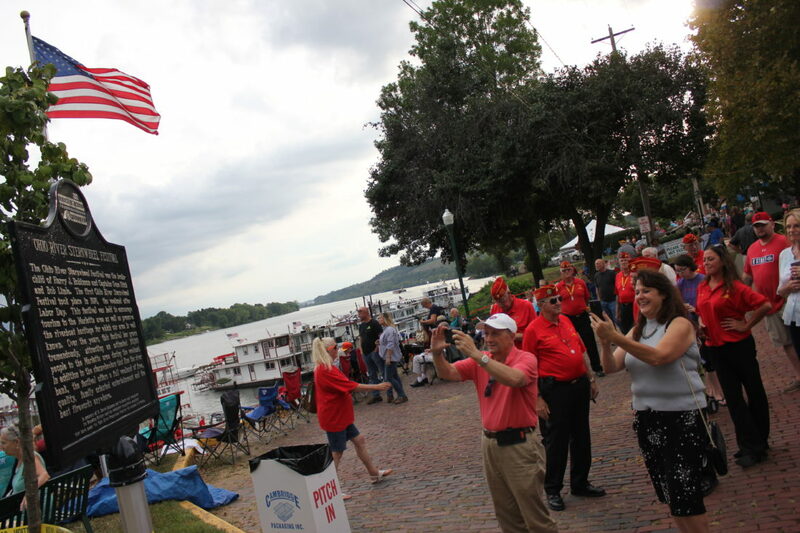 Even in its 43rd year, the Ohio River Sternwheel Festival still welcomed some newcomers to the annual riverfront event as it kicked off on Friday. The Ohio Arrows, a northeast Ohio RV club, ventured down for the weekend for their first experience of the paddleboat festival. 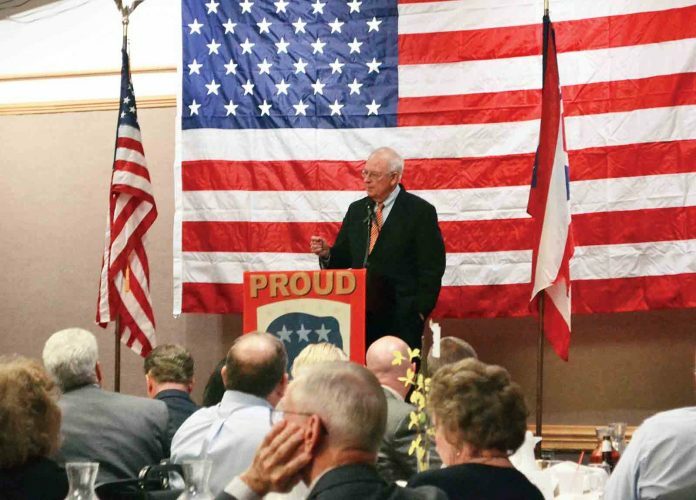 The festival celebrates the Ohio River’s history of paddle boat travel and commerce. 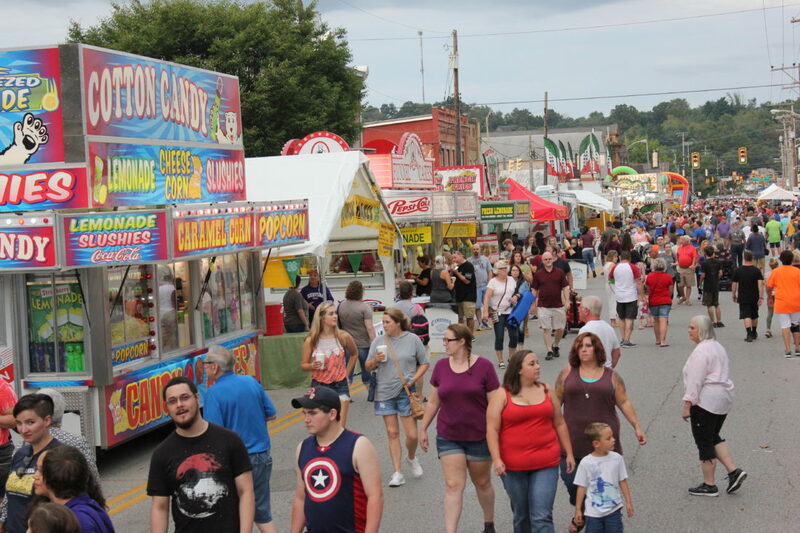 Every year music, street vendors and boat races conclude the summer festival season for Marietta. “Why do they call them sternwheelers again?” asked Gloria Woronka, a member of the Arrows, between the group’s jokes and laughter. “Because the back of the boat is a stern and that’s where the wheel is,” replied her husband John Woronka. And despite the impending rain, and strikes of lightning on the horizon, there was still a growing crowd Friday night. “Weather won’t stop this group from having a great time,” John added as the they listened to the music on the levee. But weather may stop some this weekend. The forecast is calling for heavy rain late Saturday through Sunday, with the potential for flash flooding. Up to an inch is expected Saturday night with 1 to 2 inches of rain possible Sunday, the remnants of Tropical Storm Gordon. “We had a lot of folks call the visitor center and some folks did say they were going to cancel their reservations at the hotels because of the rain, but we were telling them the fireworks still go rain or shine (on Saturday),” said Deana Clarke, executive director of the Marietta-Washington County Convention and Visitor’s Bureau as she ventured down to the Ohio River levee to see the new memorial plaque revealed during opening ceremonies. The plaque, pressed by Marietta’s Sewah Studios, was revealed in memoriam of prior Sternwheel Committee members, including David Salzman, a longtime member of the committee who passed away last year. The marker is a permanent fixture on the levee sitting on Ohio Street, above the concrete Marietta sign in front of Kreamy Kreations. 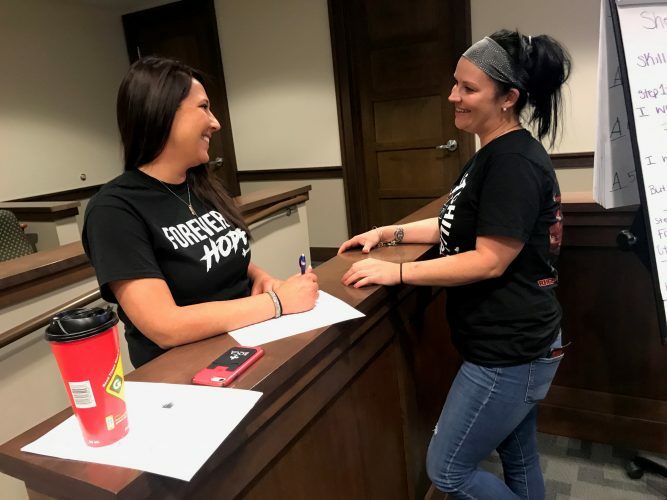 Elswick said her role for the last 28 years has been on the entertainment package for the festival and she’s hoping that the rain doesn’t drive crowds away from enjoying the lineup. 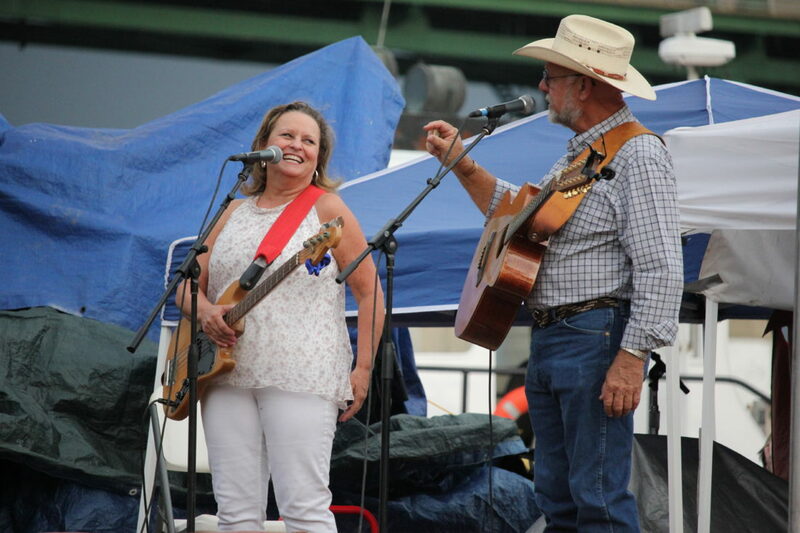 Entertainment opened up with Steve and Bev Pottmeyer on the entertainment barge with songs by Tanya Tucker and Bev noting her husband had been around for practically all of the sternwheel festivals. Another to make its first appearance at the festival though was the food truck from Lisa’s Sweet Stop. Young cross country runners Max McCabe, 12, of Marietta, and Miles Young, 13, of Marietta, landed their turns shaking lemons under the Marietta Tigers tent Friday. 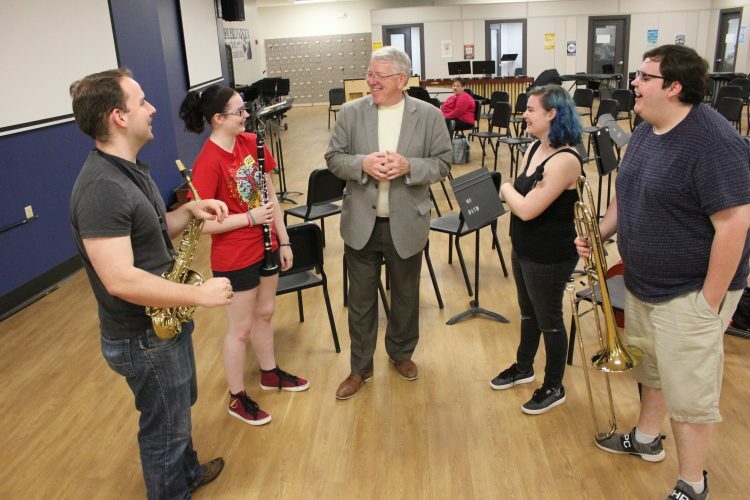 “I wanted to come down and help my team,” noted McCabe before getting back to work. • Noon – Marietta High School Wall of Sound, Ohio River levee. • 1 p.m. – Marietta High School Choir – Vocal Point, Ohio River levee. 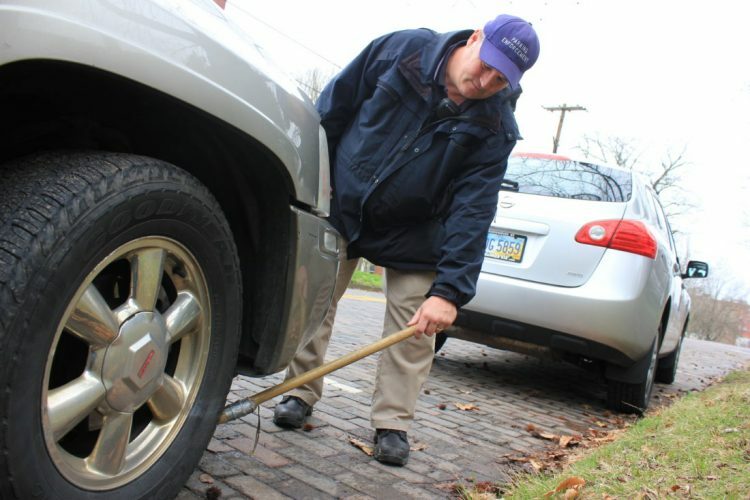 • 1 to 4 p.m. – Children’s Activities, Gazebo on Ohio Street, near the Williamstown bridge. • 2 p.m. – Two Buds and a Slap Box, Ohio River levee. • 3 p.m. – Anthony Mossburg, Ohio River levee. • 4 p.m – The Settlement Band, Ohio River levee. • 5 p.m. – Tasha Spencer, Ohio River levee. • 6 p.m. – Titus Canbe, Ohio River levee. • 7 p.m. – Coronation of Queen Genevieve. * The selection of Queen Genevieve will be announced at the Coronation Ceremony, Saturday on the barge. • 7:30 p.m. – Anthony Mossburg, Ohio River levee. • 8 p.m. – Titus Canbe, Ohio River levee. • 9 p.m. – Larger Than Life: The Ultimate Boy Band Tribute, Ohio River levee. • 9:30 p.m. – Harry J. Robinson Memorial Fireworks. • 10 p.m. – Larger Than Life: The Ultimate Boy Band Tribute, Ohio River levee. • 8 a.m. – Sunrise Service, Ohio River levee. • 9 a.m. to 4 p.m. – Car Show, Second Street in Marietta. • 10 a.m. – Alfie and Omegas, Ohio River levee. • 11 a.m. – Jake Binegar, Ohio River levee. • Noon – Phase 2, Ohio River levee. • 1 p.m. – Captain James E. Sands Memorial Races. * Sit along the riverbank and cheer on your favorite boats as the Captains line up to win bragging rights to this year’s “Captain James E Sands” Memorial Races. • 2:30 p.m. – Phil Dirt and The Dozers, Ohio River levee. Source: Ohio River Sternwheel Festival.